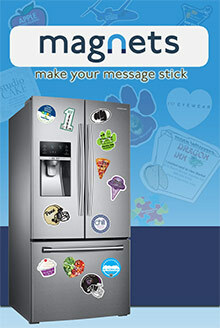 Make Your Message Stick! Use customized magnets for business, fundraisers, schools & more! For more than 20 years, Magnets has been a leading designer and manufacturer of high-quality, low cost, fridge magnets, save the date magnets, customized business card magnets, and car magnets. Join the 100,000+ valued clients who depend on them for Consultative Customer Service, Free Artwork, Free Set-up, Free Online Proofing, and No Payment Until Proof Approval! Enter the Coupon Code - catalog25 - at checkout on the Magnets.com website.